January 21, 2016 (Atlanta, GA) -- The National Beer Mile is proud to announce the first 15 cities confirmed for its 2016 race dates. Now in its second year, the event series will ultimately bring its innovative blend of fitness and fun to over 25 metropolitan cities across North America. The one-mile course designed for fitness enthusiasts, social drinkers and party-goers is capped off by an after party featuring food, games and live music. 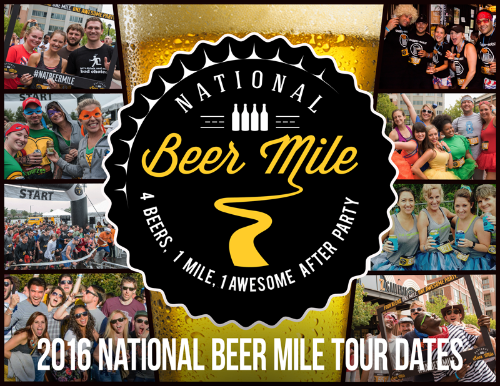 The first National Beer Mile event will be held in Jacksonville, FL on March 5. Tickets may be purchased at nationalbeermile.com. The first-ever Beer Mile started in the late 1980s as an informal event among friends. Runners would meet at a local track, drink a beer, run a lap and repeat four times. The concept hasn’t changed, but the Beer Mile has experienced a huge increase in interest and international media attention over the past 30 years. Attendance at the National Beer Mile is projected to exceed 125,000 in 2016. National Beer Mile events appeal to a diverse group of participants — from college seniors to CEOs. The majority of beer mile runners sign up as part of a team, underscoring the emphasis on teamwork, friendship and fun. Many of these teams are part of running and social drinking groups outside of National Beer Mile. This isn’t just a one-time event for them; it’s a lifestyle. A limited number of General Admission early bird tickets are on-sale now and start at $35. Early bird VIP packages are also available starting at $55 and include a swag bag containing exclusive National Beer Mile merchandise plus express check-in. Group discount options for participants registering with five or more participants are also available. Tickets will increase to an advance price of $40 for GA and $60 VIP once early bird tickets sell out. More details regarding rules and sign-up can be found on the National Beer Mile’s website and social media platforms. Tickets can be purchased through the National Beer Mile website at nationalbeermile.com. Bonnaroo Music and Arts Festival Tickets On Sale At Noon!